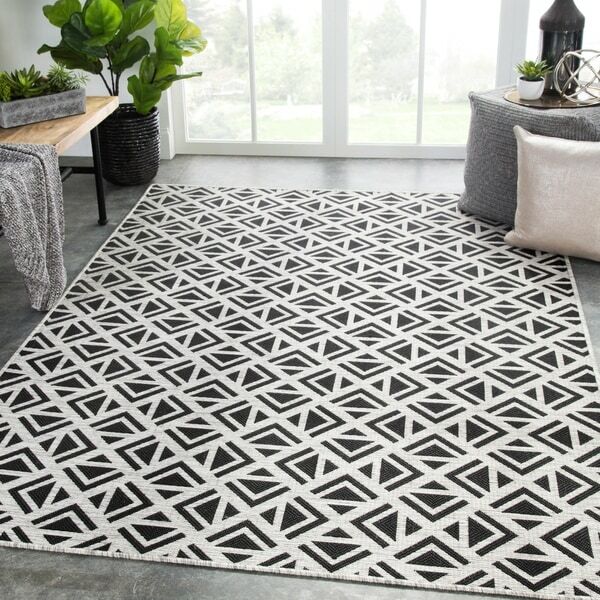 Venti Indoor/ Outdoor Geometric Black/ Cream Area Rug (5'3" X 7'6") - 5'3"x7'6"
Bold and graphic, the Decora collection designed by Nikki Chu offers compelling geometric appeal to indoor and outdoor spaces. The Tanith rug features a dynamic repeat pattern of triangular shapes, captivating in a black and gray colorway for added depth and dimension. This polyester accent is durable and weather-resistant, perfect for high-traffic areas and outdoor living. Dimensions 90.0 In. X 63.0 In. X 0.25 In. Ace Indoor/ Outdoor Geometric Black/ Gray Area Rug - 2'x3'7"